The things our art director, Chris McGee, hated to leave out of the current issue of LAM. Courtesy of New York State Office of Parks, Recreation, and Historic Preservation. From “Keeping Up Jones” by Jane Margolies in the November 2016 issue, which looks at a Robert Moses-designed beach long overdue for a naturalistic and resilient renovation. As always, you can buy this issue of Landscape Architecture Magazine at more than 700 bookstores, including many university stores and independents, as well as at Barnes & Noble. 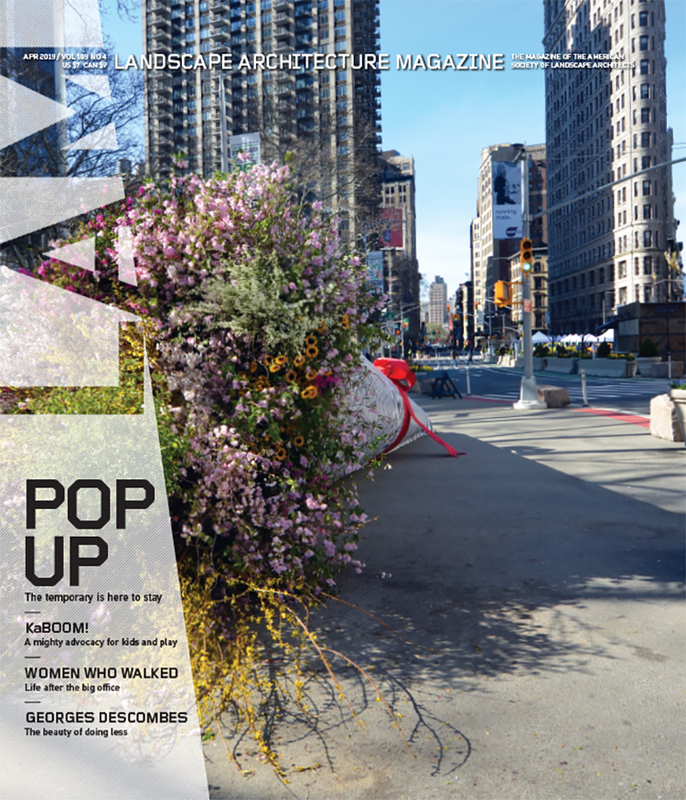 You can also buy single digital issues for only $5.25 at Zinio or order single copies of the print issue from ASLA. Annual subscriptions for LAM are a thrifty $59 for print and $44.25 for digital. Our subscription page has more information on subscription options. An iconic Robert Moses-designed park on Long Island gets a resilient rethinking. I’m standing on the boardwalk at Jones Beach State Park in Wantagh, New York, with Faye Harwell, FASLA, a codirector of Rhodeside & Harwell. Our backs to the Atlantic, we look out over a flat expanse that used to be covered by shuffleboard, ping-pong, and tennis courts. Now it’s a mountain of broken-up concrete. By next summer, this will be a rolling naturalistic setting, dotted with a rock-climbing wall, zip line, splash pool, and, yes, a couple of shuffleboard courts, too. It will be the most visible of the many changes taking place at Jones Beach in a $65 million project undertaken by the state’s Office of Parks, Recreation, and Historic Preservation and guided by a report from Harwell’s firm. This month’s LAM is like no other, as we focus all our attention in the feature section to one spectacular project: Barangaroo Reserve in Sydney, designed by PWP Landscape Architecture with Johnson Pilton Walker of Sydney. The 14-acre headland park, which fans out before Sydney’s central business district, is part of a 54-acre urban project within the lines of what had been a colossal shipping terminal. It involves practically everything that is so risky, wonderful, and artful in landscape architecture today—not least the shaping of a new stepped stone foreshore, built from gigantic slabs of sandstone hewn right from the site. It includes lush gardens along sinuous paths that trace along a dramatic slope up from the water. And the new parkland connects intimately with central Sydney. Even for a dean of the profession like Peter Walker, the chief designer, it is a once-in-a-career project. Don’t miss all the other great stuff in this issue! There are pieces on designing with decomposed granite at Kenyon College; a rather radical adventure by the military to try therapeutic landscape as an answer to post-traumatic stress disorder among returning battle veterans; a quest to uncover the history of “trail marker” trees on onetime Native American lands; and a review of a wonderful new book on the California designer Ruth Shellhorn. The full table of contents for November can be found here. Keep an eye out here on the blog, on the LAM Facebook page, and on our Twitter feed (@landarchmag), as we’ll be ungating November articles as the month rolls out.